Bappa Ditya Pal Senior Resident, Department of Anesthesiology, Index Medical College and Hospital, Indore, M.P. Shailesh Kumar Senior Resident, Bhagwan Mahavir Hospital, Pitampura, Delhi. Smriti Anand Senior Resident, Jawahlal Nehru Medical College, Bhagalpur. Background: A pain-free and stress-free post-operative period helps in early mobilization and recovery, thereby reducing morbidity and mortality. Accomplishing the subarachnoid block with local anaesthetic alone has a drawback of analgesia of shorter duration in postoperative period. Addition of opioids to local anaesthetic solution used for conduct of has subarachnoid block been found safe, devoid of any nerve toxicity and in addition it increases the quality as well as the duration of the block. Nalbuphine is a semisynthetic opioid having agonist and antagonist effects on opioid receptors and devoid of other opioid like side effects. Aim: The purpose of our study was to establish the effectiveness of intrathecal nalbuphine as an adjuvant and also the efficacy of nalbuphine for post-operative analgesia and its side effects if any. 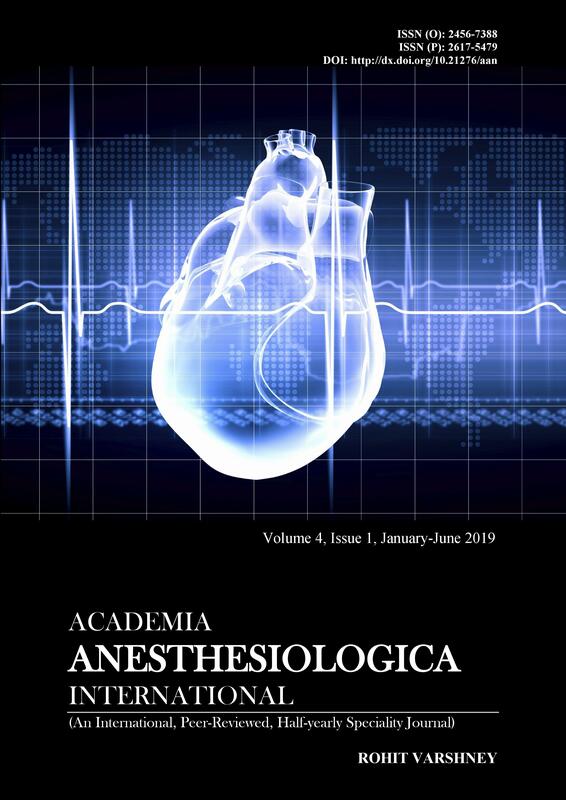 Subjects and Methods: The study conducted on 60 patients of ASA grade I and II, age group between 18-60 years, scheduled for elective lower abdominal, perineal and lower limb surgeries. Patients were randomised into two equal groups of 30 each, group I (Nalbuphine group) received 3cc of hyperbaric bupivacaine 0.5% + 0.8 cc injection nalbuphine preservative free (0.8mg) intrathecally, Group II(controlled group) received 3cc of hyperbaric bupivacaine 0.5% + 0.8 cc of injection normal saline intrathecally. Statistical analysis was done using appropriate tests. Results: The mean time of post-operative analgesia in nalbuphine group (Group-I) was found to be highly significant (P<0.001) than control group (Group-II), no patient developed any side effects in our study. Conclusion: Nalbuphine hydrochloride provides better quality of blockade as well as prolongs the post-operative analgesia when used as adjuvant with bupivacaine in spinal anesthesia.